The name consists of two parts; one meaning sacred and one meaning fight. 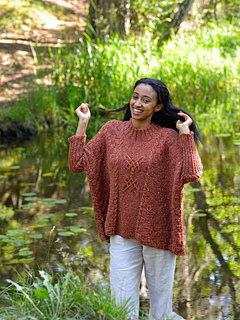 So it seems to me that this garment; sweater, tunic or poncho, must be perfect for a modern warrior godess. 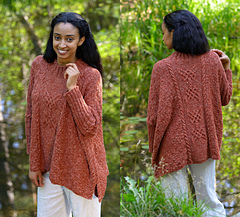 Big and cozy for a walk in the woods or for dancing in the meadows. 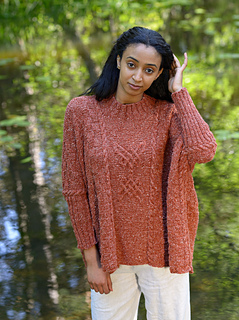 The Viking Knits Panels are nicely complimented by the block pattern, and the block pattern and cables eliminate the need for edgings – it is all straight forward knitting except for shaping the neck. Wild and sophisticated.